ON 3 June 2013, a story was published by The Malay Mail Online portal on 3 June 2013, 'Church group under probe for "Allah" Facebook post' with regards to NECF. We refrained from giving new comments to the media on the issue but we want to give our members and churches a clear chronology of events and to seek your prayers for wisdom and boldness as we deal with the authorities in the coming days. 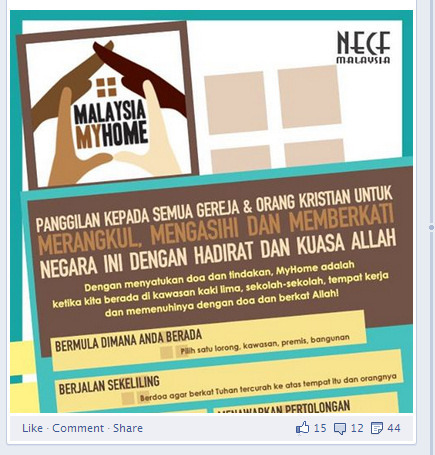 30 April NECF launched the prayer initiative 'Malaysia My Home' on Facebook. 9 May E-flyers urging Christians to "embrace, love and bless the country with God's presence and power" were translated into Mandarin and Bahasa Malaysia, and posted on the Facebook page. The BM translation used the word "Allah". 14 May A Muslim NGO, JATI, lodged a police report in Shah Alam against NECF for using the word in the Malaysia My Home' Facebook page. 14 May The Muslim Lawyers Society of Malaysia (PPPMM) accused NECF of "criminal blasphemy" against Islam. Its comments were published in The Malaysian Insider. 15 May NECF responds to PPPMM's accusation with comments by Secretary-General Eugene Yapp, to The Malaysian Insider. 27 May The Selangor Islamic Religious Department (JAIS) issues a letter, calling Yapp and NECF Chairman Rev Dr Eu Hong Seng for interview at their office. 25 June NECF meets JAIS. In the meeting, both parties reiterate their respective positions on the use of "Allah". No official statement is recorded. At the time of writing, we are still waiting for further developments and are being advised by legal counsel. In reflecting on this episode, we have asked ourselves if there are some occasions when it is "not worth it" to use the word. But then, our BM-speaking colleagues from East Malaysia will remind us that the BM churches have for so long understood and worshipped the Almighty, Creator God with this word. As we have expressed before in many of our other articles, we believe BM-speaking Christians have the historical, linguistic and textual basis to use the word "Allah". And beyond these reasons is the larger principle of the freedom of religion that we uphold, not just for Christians but for all citizens regardless their faith.